Look at your gaming portal through the players’ eyes and not your own! It is amazing (not in a good way) to find gaming operators who make some rookie mistakes when it comes to player experience. I guess it is from operators still making money just by having a site with games on it. But I know that it will change and in a year or two the ones that aren’t taking player experience seriously will have a hard time to compete with the rest. What does a player want to do when they visit your gaming portal? Probably play games or look around. Their main goal is not to deposit money or register! (Players do need to register and deposit money before they can play for real money, but that is something the gaming portal want to achieve not the player. In the two examples below you can see the difference between betboo and Sportingbet. Image 1. betboo’s start page. On betboo’s start page the focus is on registration and deposit money. Image 2. 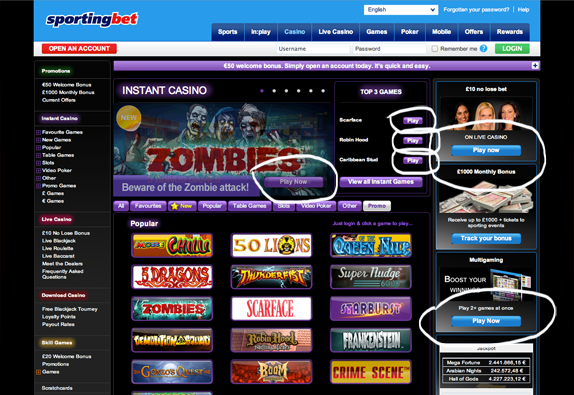 Sportingbet’s casino page. On Sportingbet’s page the focus is on getting the players to play. Sportingbet’s page is very cluttered but at least it focus on getting players to play, not deposit money. So my recommendation to betoboo is to try to see their gaming portal through the eyes of the player, not their own.